Many of you out there have been chomping at the bit to get your hands one of Tasty Minstrel Games’ newest releases: Belfort. Well there’s good news on that front as it appears that the game will be hitting arriving sometime August! What, however, is a devoted Geek to do until then? Let’s be honest waiting is so hard to do – especially when it’s the sweet, sweet scent of fresh cardboard that you’re waiting for! Well maybe we can do something to help you out! How would you like to know more about the game? Interested in seeing some yet to be released artwork from the game? How’d you like to know where you can find an electronic version of the rules? Perhaps you’d like to get to know the designers Sen and Jay a little better? Well maybe this will help! Please find below a fascinating, and extensive, interview with the designers of Belfort. Throughout the interview you’ll find some never before seen artwork from both the prototype and final versions of the game. Towards the end of the piece you’ll also find a hyperlink to a YouTube video posted by Sen and Jay in which you can find out even more information about Belfort and how it developed from a game with just twenty-four tiles into what it is today. All of this and more below! Let the interview begin! Gentlemen, it's a real pleasure to be chatting with you today! Could we start off by having you tell us a little bit about yourselves? What do we need to know about Sen and Jay? Jay: I love being entertained, and entertaining others. I also love creating things that will provide entertainment for others. Board games are one creative outlet for me, but I have been a performer for years and involved in everything from improv and sketch comedy troupes, to Shakespeare plays, to my own one man kid’s show called The Adventures of Bertolt (http://www.bertolt.ca). Recently I have also entered into the comic book world with another friend and we’re writing some scripts now, so we’ll see where that goes too! Sen: I love designing games, playing games, talking about games, buying games, looking at games, dreaming of games. When not totally pre-occupied with games, I love spending my time with my wife and kids…mostly, we play games. My day-to-day job is as a pediatric occupational therapist. So, I work with kids…mostly, we play games. I guess you could say that my life kind of revolves around games. Seriously though, I do other things as well, like dj-ing and producing music (http://soundcloud.com/phantohms) as well as practicing Brazilian Jiu Jitsu at a competitive level. So, some non-game related things…though, BJJ has been equated to human chess. So, yeah...I guess games do rule my life. Thanks for sharing those details gentlemen! Now, how about providing us with an overview of your forthcoming game Belfort? Can you give us some insight into the theme, mechanics, and victory conditions of the game? 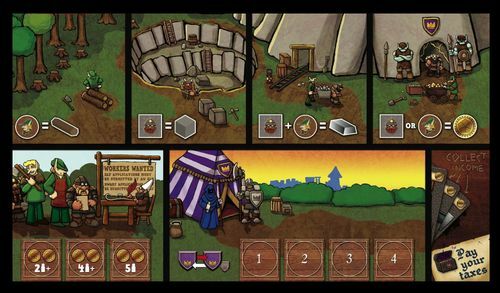 Sen: In a nutshell, Belfort is a worker-placement and resource management game set in a fantasy realm where the player who builds the most buildings in the castle wins. Jay: To expand on that a bit, players are competing architects who are all trying to construct buildings and win the King’s favour (hmmm, that describes about 25% of all Euro games doesn’t it?!). 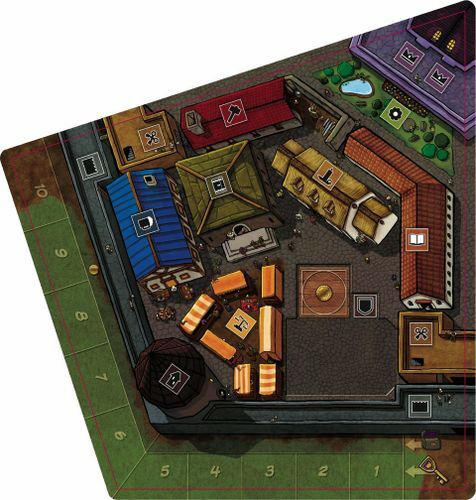 Players have Elves and Dwarves that they can send out to do various things, like collect resources, go to work in one of your already completed buildings, recruit more workers, go to the King’s camp to change player order, or visit a guild to take advantage of various special abilities. So Belfort is a worker placement game and a resource management game. 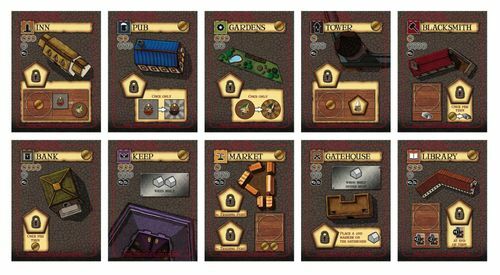 Players will use these resources to build a building that they have a card for and then place their ownership marker on the board on one of that type of building. 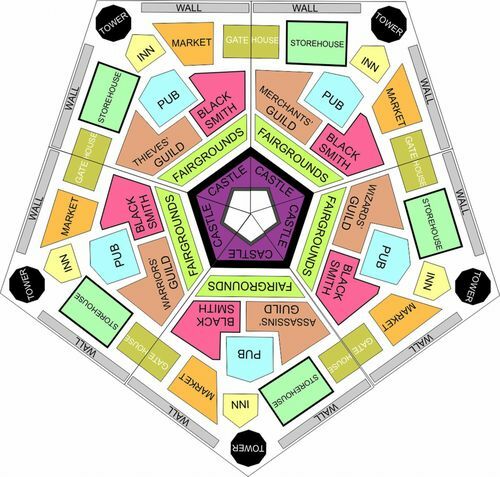 There are three scoring phase during the game, during which each of the five districts are scored individually, and the players with more buildings in each district receive points. Players can also get points by having the most Elves, Dwarves and Gnomes. Jay: Yup, Gnomes! Honestly, who doesn’t love Gnomes? Since they’re so smart and efficient, Gnomes can be hired during your turn to work at one of your constructed buildings and they unlock a special ability of that building, like the ability to get a free card every turn or even to "supersize" your Elf into a Master Elf who will work twice as hard for the same amount of pay! Jay: At the end of seven rounds the game is over and the player with the highest score is the winner. This is, of course, just an overview - I didn’t even mention all the different guilds and how they impact the game, or the tax brackets and how they keep everyone in the game, or the bonus you get for sending the most of a specific worker to a resource area. So gentlemen, where did you find your inspiration for this game? Sen: A lot of times, our games come from simple things, like a funny working title or a novel mechanic. In this case, Jay wanted to do a resource management game that was kind of an homage to real-time strategy games like Warcraft or Starcraft, with peons collecting resources and making buildings that allowed you to do different things with those resources. I had an earlier idea for a game in which you had elvish carpenters, dwarven bricklayers, merman plumbers and the like upgrading castles and trying to flip the property for more gold. The two sort of inadvertently got intertwined and become the start of Belfort. Sen, you mentioned to me one time that Belfort began its life as a deck of twenty-five small cards. Can you guys give us an overview of how this game grew from such humble beginnings to become what it is today? Jay: We had an idea for a series of games with a self-imposed limit of using only twenty-five tiles. We had already made two or three of these so-called "Games on the Go" and thought they were pretty cool, so we started thinking about how other types of games could be reduced to just twenty-five tiles. As Sen said, I wanted to make a game reminiscent of Warcraft 2 – a game where you’re sending workers out to get resources, and then using those resources to build buildings. So, I figured out a way to make this game in just twenty-five tiles…. Jay: Yes, we did need paperclips to keep track of each resource on those tiles! I remember that as soon as Sen played it he said that he liked it, but that it needed to be a bigger game. I was a bit disappointed at first because I was really trying to accomplish our goal of making the game work with those twenty-five tiles, but once we made our first larger prototype, I could see that there were a lot more interesting options available to us. Sen: We ended up adding the whole worker-placement mechanic to drive resource collection and the area control scoring mechanism. It didn't start as a worker-placement game at all – but it just grew and grew and grew! And then, through play-testing, we had to prune off some of the overgrowth. That was tough, bur refreshing. Ahh...play-testing! What impact did play-testing have on the overall evolution of the game? Sen: Play-testing essentially changed the way the game was played. One of the most critical points was the introduction of gold as a resource. 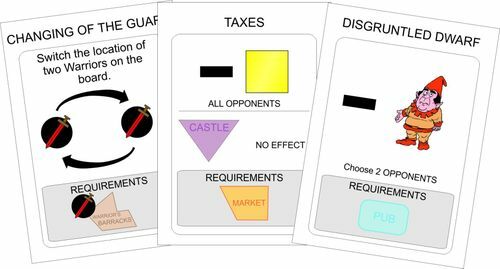 One of our testers commented that he found it frustrating to not be able to convert resources into money and then buy whatever he needed and others concurred. Jay: Right, I remember now! Originally, we had tried not to include gold, but after listening to our player-testers and implementing gold in an interesting way, we felt that it added a much-needed fluidity to the economy. It allowed us to charge gold for things that didn't make sense to be paid for in raw materials and allowed us to implement a taxation system that keeps everyone cautious, but not tight-fisted. Sen: Play-testing also lead to the name of the game. Belfort has gone through many incarnations and has been known variously as ‘Castletown’, ‘Castle Alnwick’, and ‘that game with the paperclips’. So why did you decide to call the game Belfort? was one of those castles. So the game was named after the castle, but really has nothing to do with the French town. The real Belfort is, by all accounts, pretty boring! Our Belfort is fun and full of life (and gnomes)! Jay: What’s great about the history of the actual town of Belfort is that there was a siege there that lasted for weeks. The entire fort was in a critical position that armies couldn’t get around. This is great because at one point in the history of our game we had an idea of an advancing Orc Horde that would attack the castle. We ended up removing the Orc Horde (they really frightened the Gnomes! ), but it certainly is an option we’re keeping in mind for a future expansion! Is anyone interested in quick history lecture about how those ‘five-sided’ castles were actually a type of fortification known as the trace italienne? Want to know more about how those fortresses emerged as a defensive reaction to the rising popularity of gun powder weapons during the fifteenth century? And how, if you follow the interpretation of the historian Michael Roberts, the trace italienne played a critical role in the eventual formation of the modern nation-state? Sen: Ummm, yeah, sure that sounds very stimulating – will there be miniatures and wooden cubes used as props in this lecture? Jay: Only if this story involves Gnome Artificers and better yet, Dwarven Sappers! Game designers (much like writers) are often faced with the tough reality of being forced to cut out elements from their much-loved-creations. Were there any elements of the prototype editions of Belfort that, sadly, had to be left on the cutting room floor? Sen: There was originally an event deck, a dragon that smashed buildings and warrior pawns that defended against said dragon, the aforementioned advancing Orc Horde, and a tonne of different buildings and guilds to work with. Jay: Sometimes I do miss that Dragon! I think we pillaged our copy of Blue Moon City for a red dragon to use for our play-tests! But we had to strip things down so that each decision was important and so that the game didn't last longer than it should. Many of these items were removed after listening to our play-testers. If they felt certain components were too fiddly or parts of the game felt "tacked on" we removed them from the game wholesale. Sen: Basically, if a player could tell that something wasn't a cohesive part of the game while playing it, we didn't want it in the game anymore. We wanted the core game to feel like everything was supposed to be there and that everything fit well together. But who knows… You may see Dragons in the skies and Orcs in the forest in the future…. What have you been most pleased with in terms of the finished product? when it comes to the quality of the artwork. As a game designer you really don’t have a say in who they will choose to create the art for your game, and I just couldn’t be happier with how it turned out! Sen: The art work is stupendous. Josh Cappel is the artist for Belfort and a fellow Game Artisan of Canada member. Josh breathed life into our little castle. You not only see it on the game boards, but in the flavour he helped add to the rules text. I'm particularly fond of the clipboard artwork and all the jokes and "Easter Eggs" that Josh hid in the art and rules. When you open the box and see all the bits, all the love that went into crafting the boards...it's just inspiring. Jay: I’d also like to give a shout out to Seth Jaffee who developed this game for six months. He would play-test it with his group and then we’d all discuss some new ideas. Nothing drastic or game changing – but things like how much stuff would cost or tweaking the effects of some of the powers. He added the fact that some buildings can have multiple Gnomes while others can have none. That was a nice addition. Alright, enough chit-chat gents – when can we see some of the finished artwork for the game? Sen & Jay: Why right now, in fact! Here you go! Fantastic! The artwork looks magnificent! Now could we shoot for the moon here and ask for a link to an electronic version of the rules as well? Now, we know that this is tough question to answer (especially before the game has even been released!) but out of compassion for all us addicts out there – do you have any thoughts about an expansion and, if so, what ideas have you kicked around? Sen: Well, there's always the invading Orc Horde to worry about! Josh created a race of blue-skinned humanoids that stand guard at the important places in Belfort called the Goons. We figure that the Goons and the Orcs could bash each others' brains in some day! Jay: There was a thought of making a much more meddling and ‘evil’ version using Goblins and Ogres instead of Elves and Dwarves. It would require a new board, but there would be a lot more player-vs-player screwage. Of course this will appeal more to some than to others – but it’s an interesting idea. Sen: I also have a concept in my head for a stand-alone game set in the world of Belfort revolving around the five wizards' towers that are at the corners of the castle. I'm trying to figure out how it could be both a stand-alone game AND an expansion to the main game at the same time - that seems to be all the rage right now, what with Thunderstone: Dragonspire, et cetera. But whatever we do there will be NO TROLLS ALLOWED! O.K. one final question about Belfort! Imagine this situation: A WWE style, steel cage match between an Elf and a Dwarf master craftsmen from Belfort. In a battle to the finish – who comes out on top? Jay: Hmm...good question! After all, the elves and the dwarves don't really get along well together. Well, they both have their key advantages. The elves are: taller, skilled with an axe, skinnier, more charismatic. But, the Dwarves are stronger and handy with a hammer. In a fight I'd probably have to go with the Dwarves, but an elf might be able to talk his way out of a fight before it even happened! Sen: As a martial artist, I can guarantee that almost all fights end up on the ground. And that’s where the Master Dwarf would dominate. I’m let’s be honest, the Master Elf would definitely be the fan favourite – especially with the ladies. And to be sure, the Master Elf has got a reach and speed advantage. The elf might be able to win on points if he could keep the fight standing – but, ultimately, given the granite chin of the Master Dwarf, he lacks the KO power to end it on his feet. Not to mention that the Master Dwarf is also an expert in Dwarf-Jitsu, a much more practical art for the ring or cage. Elf-fu might look pretty, but it’s never going to end the fight. So, I predict that after a few ineffective jabs and maybe an axe kick or two from the Master Elf, the Master Dwarf will proceed to take down his opponent with a quick double leg and end the match in the first round with vicious hammer fists from the mount for the TKO via ground and pound. If the Master Elf can somehow survives that barrage, look for the Master Dwarf to transition into a hammer lock submission – his specialty. But remember, if a steel chair gets thrown in the ring, all bets are off! At a personal level, leaving aside the games you have designed, what are some of your favourite games to play? Sen: I like a good, cutthroat three-player game like Basari or Carolus Magnus, as well as trick taking cards games like Tichu and Schnappchen Jagd. I also enjoy solid two-player games like Balloon Cup; multi-player wheeling and dealing / bluff games like I'm the Boss and Cash & Guns; abstracts like M and innovative co-ops like Space Alert. I also enjoy full on party games like Tadaaam!, not to mention that I have a passion for dexterity games like Carabande. Having two small children and working exclusively with kids, I also enjoy children's games like The Magic Labyrinth and Jungle Hunt. Of the more recent crop of games, I've really enjoyed Gosu and 7 Wonders. I’ll also confess to being a recovering RPGer, Miniature Wargamer, and MtG addict – so I’m also a sucker for any game that emulates those games in some way (without requiring as much money or time). In this respect, Battlelore currently fills that gaping chasm in my soul – and since my seven year-old son loves the game too, it's all good. Jay: I’m a Euro gamer through and through. I love games where most of the randomness affects all players equally. As such, I enjoy games like: Tikal (using the auction variant), Torres, Entdecker, Domaine, Dominion, Troyes, 7 Wonders, Tempus and Vikings. That said, I still enjoy and love other types of games like Tichu - I play it daily on my iPod! – as well as: For Sale, Telestrations, Balloon Cup and Quelf! 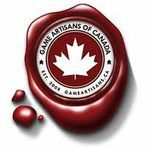 You guys are members of the Game Artisans of Canada – can you tell us a little bit about this organization and how being involved with G.A.C. 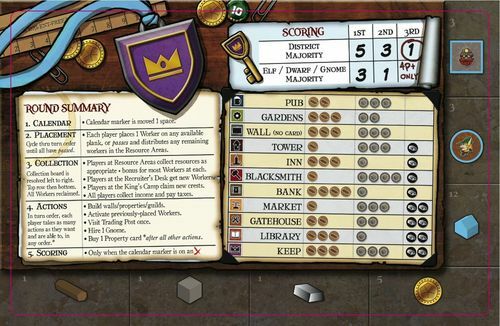 has shaped the way in which you designed Belfort, or any of the other games you have produced? Jay: We joined Game Artisans of Canada - a national group of game designers who help each other improve their prototypes - after we had signed the deal to get Belfort published, so they didn’t have any input on this game. But Sen and I are not ones to rest on our laurels and we’ve been designing more games, and the GAC members have been extremely helpful in this regard. It’s always great to play-test your game with a variety of people, but I have found that we get the best feedback from other GAC members. They understand game design and can see the impact of their recommendation on the game system. Sen: Fortunately, Jay lives in a city where they have a chapter, so he gets to play-test our games with them quite often. In addition to just play-testing though, GAC has a forum to which we all contribute, share ideas and help each other out with challenges or hurdles in the design process. I’m looking forward to something called Cardstock. It’s when almost all the GAC members across Canada all fly into Calgary and we spend a weekend play-testing each others’ games! It’s like an Ent-moot for Canadian game designers! How awesome is that? Nice treefolk reference there Sen! On your blog ‘Inspiration to Publication’ you refer to yourselves as the Bamboozle brothers – where did that name come from? Jay: Heh – I got this one! In my spare time, as I mentioned above, I perform as a children’s performer. Doing this has taken me on the busker circuit and I met quite a number of other buskers. Meeting these folks got me thinking about doing another show in addition to the one I was doing, and I came up with this idea of a duo called the Bamboozle Brothers. The trick was that one of the Brothers would never show up to the show – which would frustrate me, but I would carry on with the show but get audience members up to participate and ‘be’ my brother for certain bits. Sen: Oddly enough, our game modus operandi kind of stays true to the original Bamboozle Brothers premise – Jay is definitely the “face” of our team. He’s the one that goes to the conferences and schmoozes with the high-up muckity-mucks. I like cowering in the shadows – behind the scenes, as it were. We’re planning on growing that name in the future with a professional website where we will sell all of our published games as well provide some Print on Demand or even Print and Play games that haven’t been picked up by a publisher yet. It’s a work-in-progress. For your first game, Train of Thought, you produced a video to help promote it (http://www.youtube.com/watch?v=IqT5oDPRUHk). Why did you do so and do you plan to make a similar video for Belfort? Jay: You know, when an author pitches their book to a publisher, the publisher will likely spend 30% of the time asking what the book is about and up to 70% of the time asking you how you’re going to help promote it. In the board game world it seems like once a designer’s game is picked up, they’re off the hook and it’s all the publisher’s responsibility. Well, Sen and I think that it only makes sense to help promote our games as much as we possibly can. Sen: Jay is a ‘performery’ (not sure that’s an actual word!) kind of guy and he’s got connections to people who can help put a video together. He brought the actors together (and that main guy in the video is actually Jay, if you didn’t know! ), and got the whole thing filmed and edited. Then I created the music for the video and a friend of ours created the animated thought bubble! So basically we found a way to do it all on the cheap while keeping the quality high. Jay: We have another video planned for Belfort, but this one will be almost entirely animated. We’ve scripted it out and now have to start putting it together so that it’s ready around the time the game launches! Also, I have been writing a comic book set in the world of Belfort along with my friend Tim Rienert – check out his excellent blog at http://fourcoloursandthetruth.wordpress.com/ and you’ll see just how knowledgeable he is about comics. We’ve found an amazing artist who’s currently providing us with sketches and page layouts. This comic should be ready around the same time of the launch. We’re not 100% sure how we’ll release it, but it will be for free! Sounds exciting! But let’s say we were jonesin’ for a fix – is there any other video content that you can direct us to that’s available right now? What does the future hold for the dynamic duo of the Bamboozle brothers? Sen: Hopefully, plenty more games. As we mentioned, we want to strengthen Bamboozle Brothers as a brand. We've also been toying around with some ideas about writing a book as well. Jay: We’re constantly designing more games that we will pitch to publishers. As of this writing we have a very interesting tile-placement and pick-up-and-delivery game called Akrotiri being reviewed by Z-Man games. That game is also concurrently a semi-finalist in the Canadian Game Design Contest! We have a quick reaction family game called Jam Slam with Gamewright. E-I-E-I-O – a quick reaction game set on a farm. Cloonatics – a party game in which players can only give slivers of a clue to the other players. Junkyard – a wooden dexterity/stacking game that has layers of strategy. Lost For Words – a quick word game with simultaneous play and challenging strategy. What sage words of advice do you have for all those budding designers out there that can help them out in terms of successfully shepherding a game from idea, to proto-type, to publication? Sen: …that we took to get Train of Thought and Belfort published by Tasty Minstrel Games. I think the "MVP" acronym Jay came up with is probably the best single piece of advice from that series, though. Jay: To be a game designer (or potentially anything involving creating something) you need to be an MVP. You need to have Motivation, Versatility and Persistence. We stay motivated because we have each other and because we use an online forum that helps us keep track of our ideas and helps us communicate. This keeps us motivated as I am always excited to see if Sen wrote something in the forum every day, and it motivates me to contribute the same way. 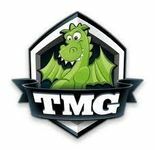 We believe a lot of our strengths come from the fact that we are versatile and have designed games in many genres using many different mechanics. We’re not betting our entire life savings on one design that we think will make us a million dollars! If one doesn’t hit the mark, then we have a dozen more that are waiting to go! We can assure you that, if we hadn’t been persistent, we would have failed. A lot of people, when they create something for the first time, come to the realization that it doesn’t meet their own standards of what excellence is and then they abandon the creative vocation altogether. However, we’ve managed to stick it out and we’ve designed many, many games. Belfort, for example, was probably the tenth game for which we made a prototype! So without perseverance we wouldn’t have made it! Well ladies, gentlemen and fellow geeks – there you have it! A fantastic interview with Sen & Jay about their forthcoming game Belfort! We certainly thank them for their time and their thoughtful answers to our many questions and we wish them much success in their future labours! Thanks for the interesting and entertaining interview! It is neat to see how a game develops "from humble beginning" to a more complex level! It is also nice to see a Canadian game getting published. Thanks for reading, Judit. Hopefully, you'll enjoy the game as much as the interview! This was a great interview. Thanks. I am so excited for this game. I purchased the Tasty Minstrel package (Homesteaders, Belfort, and Jab) mostly for Homesteaders. I also thought the tagline for Jab sounded kinda cool, but I didn't know anything about Belfort. But since I made the purchase, I have read the Belfort rulebook. Oh, man. This game sounds awesome. Everything I read makes me more and more excited for the game. I can't wait to play Belfort. Great interview, thanks for sharing it! Man, I wish I could have play-tested Belfort, would have loved to have played it by now. In my opinion, Belfort is set up well for some expansions. Also my opinion, but some of the best expansions are simply ones that add more variety in cards, etc. to the game. Maybe add variations to the properties and new guilds and make it an expansion. I really like how you've made recommendations for choosing guilds based on if you want a Beginner, Intermediate, or Advanced game. I was on the fence about Belfort. After reading this review and seeing the final art, I just put in my order. I would strongly suggest putting more of the completed art in the picture section of BGG.